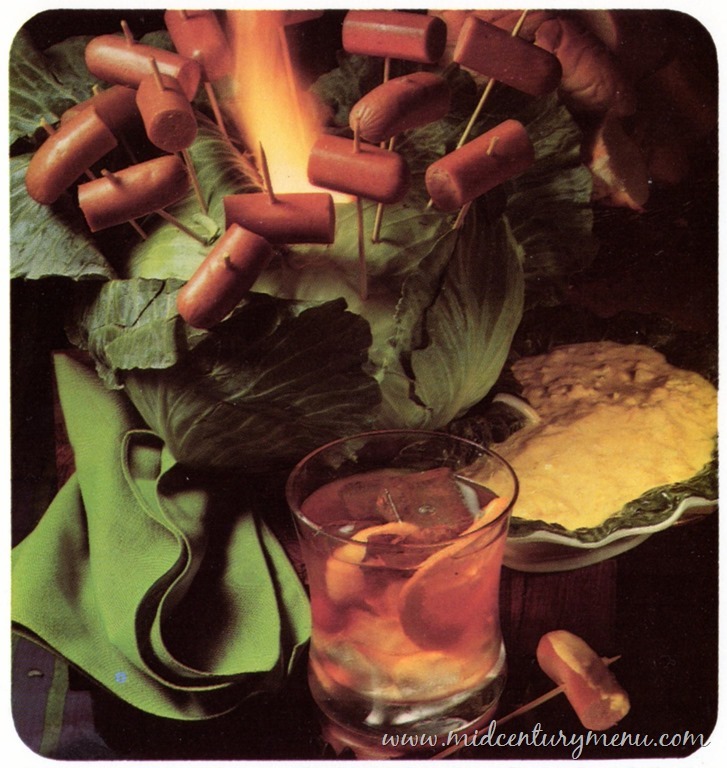 What better to go with an Old Fashioned than an old-fashioned weenie roast? 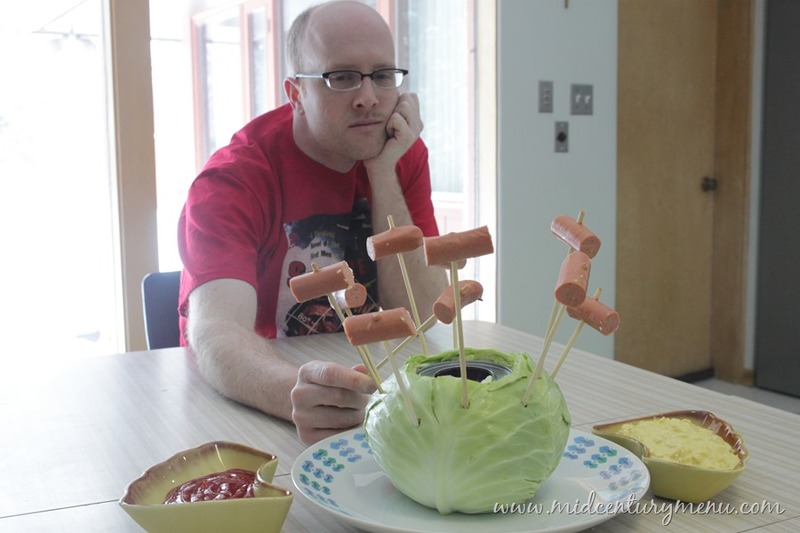 This creation, which reached its apex in the mid ‘fifties, fell into low repute as fondue cookery caught on and upstaged it; but recently, as more and more apartment dwellers yearn for the pleasures of outdoor living, the humble indoor weenie roast is coming back into its own. Trim soiled outer leaves from cabbage head; slice off bottom of cabbage so cabbage sits upright steadily; hollow out top of cabbage to make well for canned liquid heat; place can in well. Finely grate cabbage pieces left over from making well in cabbage head; place in saucepan; add water and vinegar; bring to low boil and cook over medium heat 15 minutes. 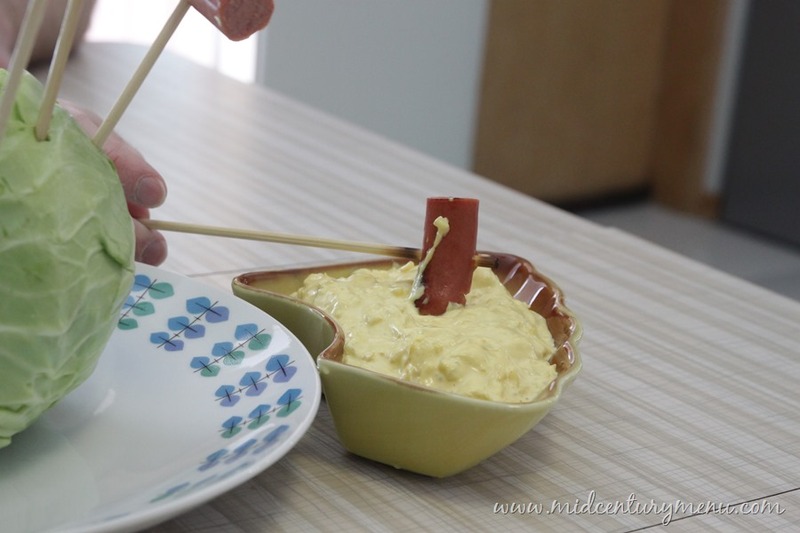 Remove from saucepan and drain; blend in mayonnaise and mustard. 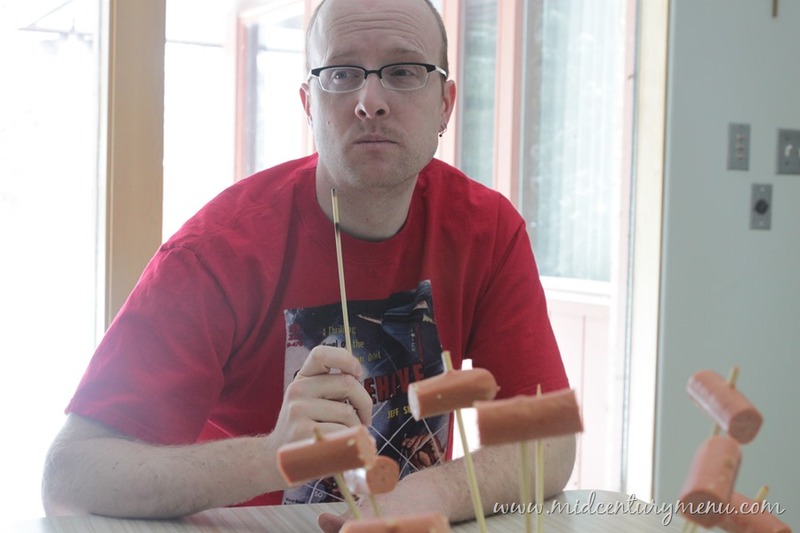 Cut frankfurters crosswise into thirds and skewer on 8-inch bamboo cocktail skewers. Spear into sides of cabbage. 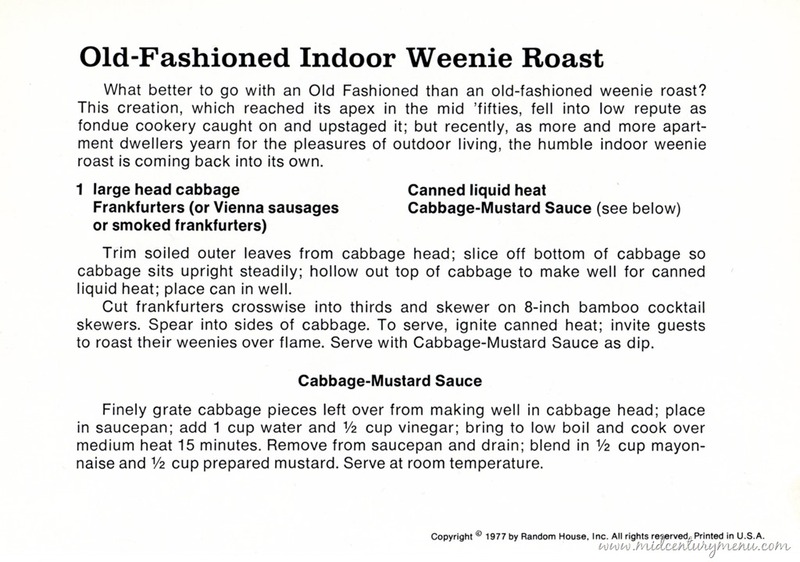 To serve, ignite canned heat; invite guests to roast their weenies over flame. Serve with Cabbage-Mustard Sauce as dip. The whole roasting things in the house made Tom a bit nervous, but I think if I would have given him a few more cocktails, that nervousness would have faded. 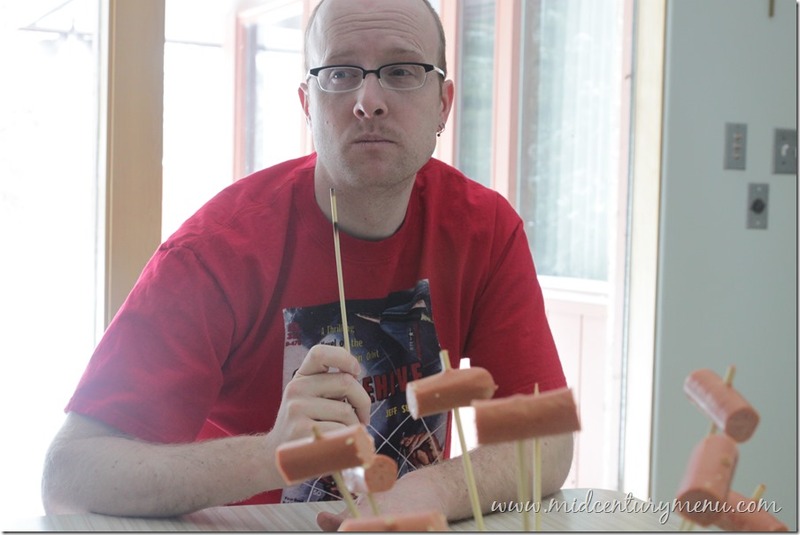 It was actually kind of slow to cook the hot dog, and if you had a bunch of starving people it would be kind of a pain to wait for your turn. However, if everyone wasn’t very hungry and it was just something to nibble on with cocktails it would be a fun party novelty. The Cabbage-Mustard sauce is good, although it is sort of a waste on a hot dog. It would taste amazing on a brat. It was a nice, tangy sauce with a good crunch. Come back on Friday, where we make the Old-Fashioned Cocktail that goes with the Old-Fashioned Indoor Weenie Roast! I think I’m going to have to make that first picture of Tom my desktop wallpaper. You bring up an interesting point in the Tasting Notes about giving Tom a few more cocktails: how hilarious would these Mid-Century Recipe Tests be if Tom were drunk? 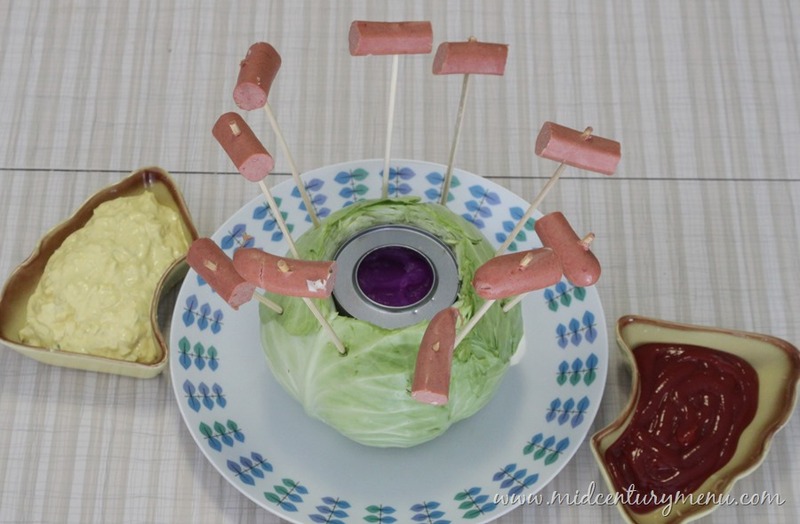 My sister and I did this for a fifties-theme birthday party, using the small can of Sterno and miniature cocktail wieners. 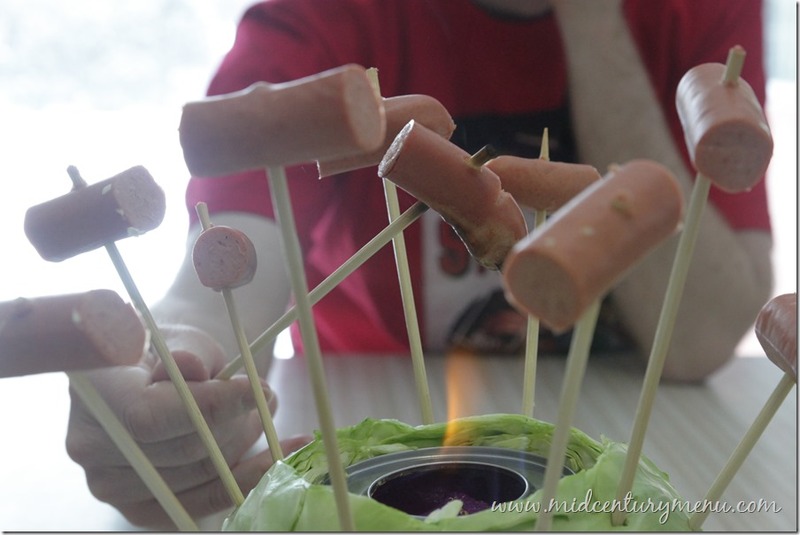 I think our skewers were too short or thin or something because the skewers kept catching on fire and the wieners would fall into the flames. Entertaining but not very successful. Heavy duty skewers are definitely the way to go. I have the amazing good fortune to live in a 1970s apartment that has a wood-burning fireplace. This reminds me that I really should roast hot dogs and marshmallows in my fireplace (and pop popcorn, if I could find one of those old metal popper-things). I am actually quite grateful you made this — Buzz has been suggesting cooking this for a while, and I’ve been running out of excuses! 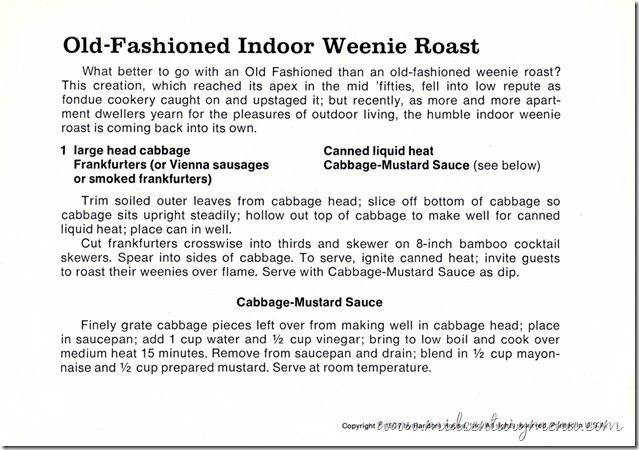 That cabbage-mustard sauce certainly looks right for a good sausage…. Aw, I was looking forward to making one of these. I like any food with open flames. Been a fan of the site a long time; your writing style is always entertaining and the pictures of Tom are always hilarious…especially for the more revolting dishes. I recently came into possession of a mid-century(kinda)cookbook: Woman’s Home Companion Cook Book, copyrights 1942-44…it eve has a “War-Time Postscript” about substituting ingredients in a food shortage! I’d love to send some recipes your way but, unfortunately the book was supposed to go to my mother from my great-grandmother but my Aunt got to it first and only handed it over to my mom after she, basically, ruined it. While every page in intact and still legible, it’s obvious some kind of…moisture got to it, the cover and binding is falling off, the whole thing reeks of mildew to the point it makes my nose tingle disturbingly and it’s much heavier than it should be and, honestly I’m afraid to read through it! But if I ever do, I’ll be sure to send some horror your way…and as a side-note, I bet that cabbage sauce would be really good with Polish sausage! And the fact that the recipe called for using a cabbage a a portable grill made me laugh harder and longer than I’m comfortable to admit. 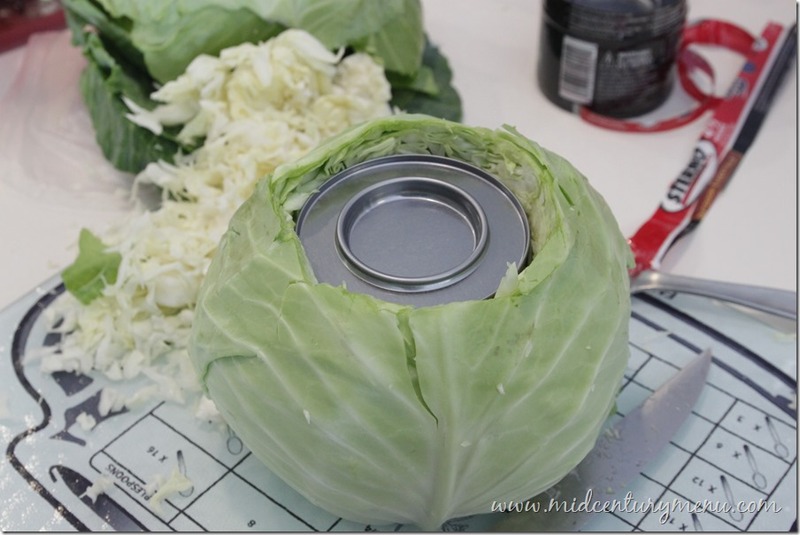 So what do you do with the cabbage? Wrap it around the roasted hot dog pieces? Salad? Or was it just something to hold the hot dog pieces and make the Sterno more decorative? —sorry, imagine I posted that comment on the Wienie Roast page.